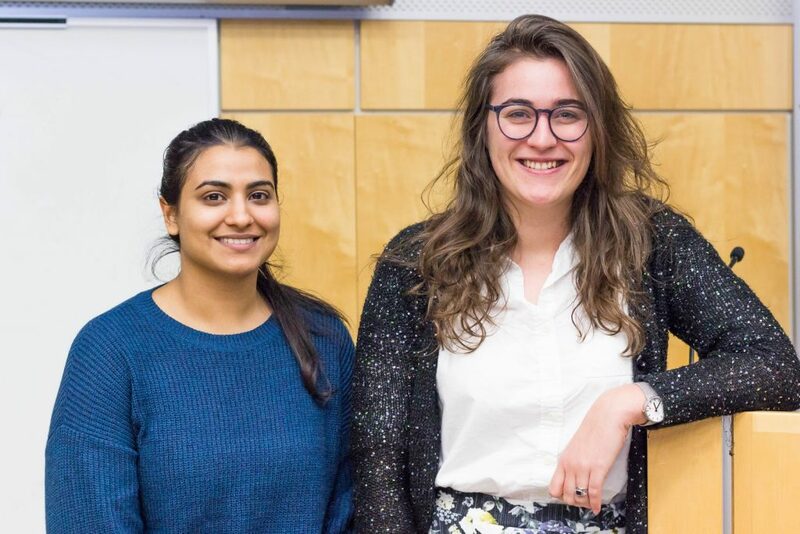 On Friday, December 14, a presentation on open lab notebooks was given by Rachel Harding and Mandeep Mann at the De Grandpré auditorium of the Montreal Neurological Institute. It was then followed by a demonstration on how to use Zenodo, an open science data-sharing platform. Lab notebooks are essential tools for researchers. They allow them to write down all the fine details relevant to their experiments, including their hypotheses, their methodology, and their results. Harding and Mann are among researchers who believe that these notebooks should be accessible to anyone wishing to consult them. Harding shares her entire lab notebook under the format of a blog named Lab Scribbles and posts her data on Zenodo, an open science platform allowing scientists to share their data. Mann also makes her data available on Zenodo, and her notebook is hosted at OpenLabNotebooks.org. When publishing scientific articles, researchers must provide the results that allowed them to draw their conclusions, but the description of the methodology can sometimes be too superficial. According to Harding, researchers should make their lab notebooks available to the people interested in their studies so that they can have access to all of the experimental details, including negative results. Harding explains: “My supervisor [Aled Edwards] encouraged me to make my lab notebook open. Since it was already in an electronic format, it only took a few clicks to share it with the rest of the world”. Harding stresses that many researchers are afraid to make the jump to an open practice, but points out the advantages of this approach: “Many of the problems that we see in science, and particularly in neuroscience at the moment, where people talk about issues with reproducibility, but also transparency, can be circumvented by having an open lab notebook where you write up every single aspect of your research project and publish it online”. Additionally, she indicates that, contrary to common beliefs, the use of open lab notebooks might even help scientists to obtain funding. This format would be particularly endorsed by patient-based charities due to better return on investment and outreach opportunities with stakeholder groups. Another considerable advantage that comes from open lab notebooks is the fact that researchers can share their results and get feedback much more rapidly. While it may take years to have feedback from others from the moment the data has been collected to the time it has been published through traditional scientific journals, this duration can be reduced to just a few weeks with an open lab notebook. Harding adds that this rapid sharing is especially relevant for researchers working on rare diseases like Huntington’s disease, which is her area of research. She was surprised by how much scientists are ready to collaborate: “It became very apparent that if you build a community where you’re sharing everything with everyone else and not asking for anything in return, people just sort of intrinsically want to share back with you”. Rachel Harding is a research fellow at the Structural Genomics Consortium (SGC) and the University of Toronto and the co-chair of the Canadian Open Neuroscience Platform Communications Committee. Mandeep Mann is a Master’s student at the SGC and the University of Toronto. An interesting article about open lab notebooks has recently been published by Matthieu Schapira and Rachel Harding in collaboration with The Open Lab Notebook Consortium. The article can be found here.